Finally finished the tracks on the lifta-droppa wagon, now only the exhaust stacks to finish and a base coat and it's ready for the big game next week. 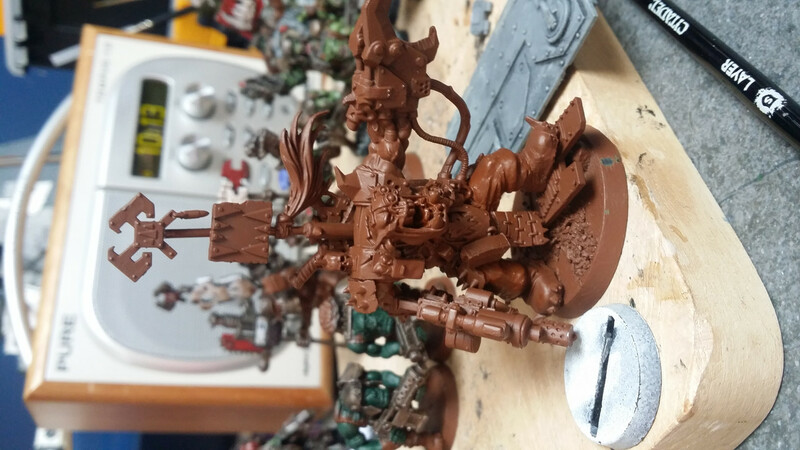 Also working on another KFF bigmekk for my other ork blob. haha--amazing lifta droppa - just a huge magnet! Perfect. The KFF node in the bottom picture almost looks like it juts out pretty far from the model (as in I would worry it would cause him to fall over) - or is the picture deceiving? I wish I could give something in the way of constructive criticism, but what can I say? I love that tank exactly as it is. At first the unconventional shape threw me a bit - it's not so much a turret as an extension of the hull. But the more I looked at it the more I just thought, "damn, that looks nasty!" Nope, his KFF is massive but he's on a 40" base and his core is one of the old pewter minis pinned to the base so is very heavy and stable, the rod is brass and extend through all the plastic gubbinz and into the main section of the generator too. Thanks, this build is actually getting on the be six months old, originally it was completely different with the main gun mounted much lower and to the left of the hull and an observation viewport to it's right but as it neared completion i decided i didn't like the way it had turned out and stripped it way back, literally to the undercarriage and rebuilt it from there. As it turns out it was a good decision because now i'm really happy with it, i often joke that i accidentally made an Armageddon pattern basilisk. Zoggin' 'eck! Your work is inspiring! Your vehicles look proper Orky and remind me of 'Rictus' (Recalcitant Daze) work! Good job, I'm definately following this! Orkses is never beaten in battle. If we win we win, if we die we die, so it don't count as beat. If we runs for it we don't die neither, so we can always come back for anuvver go, see! Rictus' stuff is amazing and i have shamelessly stolen several of his ideas for some of my other tanks, last i checked though he was a bit disillusioned with the new codex and had given up playing Orks for the foreseeable future, which makes me a little sad (not that his renegade guard aren't amazing too though). I think the biggest problem i had with this design was the lifta-droppa was too big, was mounted too low and there wasn't any space to affix additional big shootas and the like, also in hindsight the Russ base without turrent was probably too small to be used as a battlewagon equivalent. It was only very early on in the build that the first design was scrapped but i'm glad i did it now i've finished build v2. I've been following his blog for years, he has always been one of my biggest inspirations, I may have borrowed some of his ideas too! Yeah he's completely sold up now and started focusing on his resin casting, so will be interesting to see where that goes. Anyhow great work, and seeing the way you've used the computer heat sink has given me a few ideas, so thanks! Very rare full shot of WAAAGH! Mek-Klaw! From our recent apocalypse game. super impressive. Needs more Boyz!! im.. im so jealous of your orky tanks wish i was that skilled with plasty card.. great job!! Some are, in that pic only the left most one is totally scratch built but i have three more on the go that weren't ready in time, i'll post them up when finished. Thanks for the kind words everyone, Waaagh Mek-Klaw! Made up about half the ork forces on the day and sdid themselves proud even though the game ended in a tie. That's a pretty amazing army you got going there...very well done mate! Nozeminer - In the "best cheat ever" thread. Paintin' some shoota boyz for the May challenge, three more to go + finish the bossnob and i'm done early for a change! While i'm at it i don't think i ever posted my new warboss, not sure if this is a controversial statement or not but i hate the AOBR warboss so i set myself the challange of making him better using only my bitzbox and green stuff, i'm quite happy with the results. Sigh. my orks always look so sloppy when I paint them - and It's not like I"m not being clean or neat...it's just they dont' look smooth - those boys above are really crisp, and smooth. Nice layering! Snakebite ork nob & waaagh banner testers for my new snakebite contingent.